Aluminum elevator boat lifts were designed for waterways with building code restrictions. The elevator boat lift is a fixed structure with aluminum track "I Beams" which are driven into the berm and bolted to dock piles or the seawall cap. The elevator boat lift is a very strong setup for your boat. All Power Marine Boatlifts & Docks, Inc. is one of the first companies to install a hydraulic boat lift in Broward and Palm Beach counties. The 40,000 lb. hydraulic boat lift was the largest of its kind when we began installing in 2004. 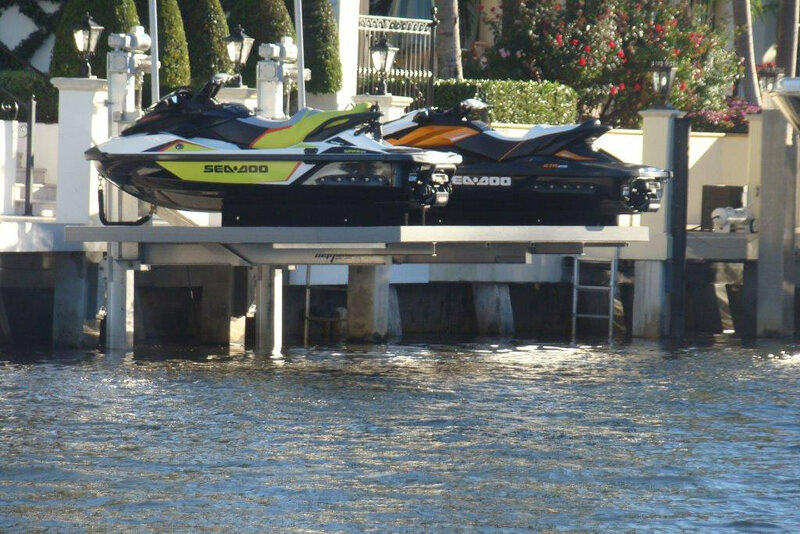 Working closely with the manufacturer, All Power Marine Boatlifts & Docks, Inc. installed a series of hydraulic boat lifts, which were four times faster than any other available elevator lift pound for pound and was considered the "elite" product on the market at the time. All Power Marine Boatlifts & Docks, Inc. is a dealer for the most popular electric driven cable aluminum elevator boat lifts in the state. We install custom elevator boat lifts supporting your boat which may range from 1,000 to 80,000 lbs.